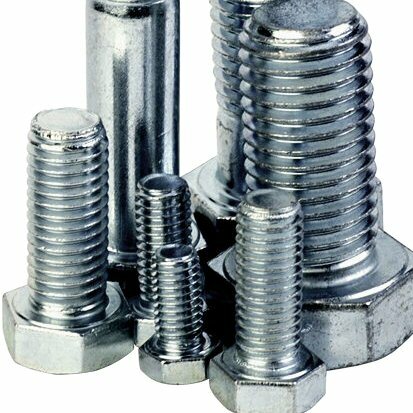 Grade 5 hex head bolts, course thread, are clear dura-plated for corrosion resistance. They are made in North America, rated for 120,000 psi tensile minimum strength, conform to SAE J429 specifications and are DIC approved. These cap screws have a rockwell hardness of c33-c39, exceeding ASTM, ANSI, GM, FORD, and CAT specifications. They are also roll threaded to class 2-A thread fit, as well as head marked with the manufacturers symbol and 3 radial lines as shown below. Certifications and destructive test results available upon request. 3/8" diameter and 1 1/4" length.